They said it couldn’t be done! We have achieved it. 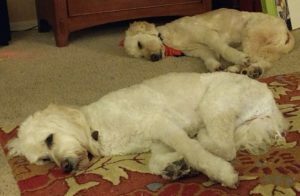 After many years (ten , to be exact) of practiced sleeping, we are now perfecting the phenomenon of synchronized sleeping! This is not as easy as it may seem because if you are truly sleeping, you can’t even see your teammate! If we can get the Olympic Committee to add this event to the Olympics Venue, we will be coming home with GOLD.